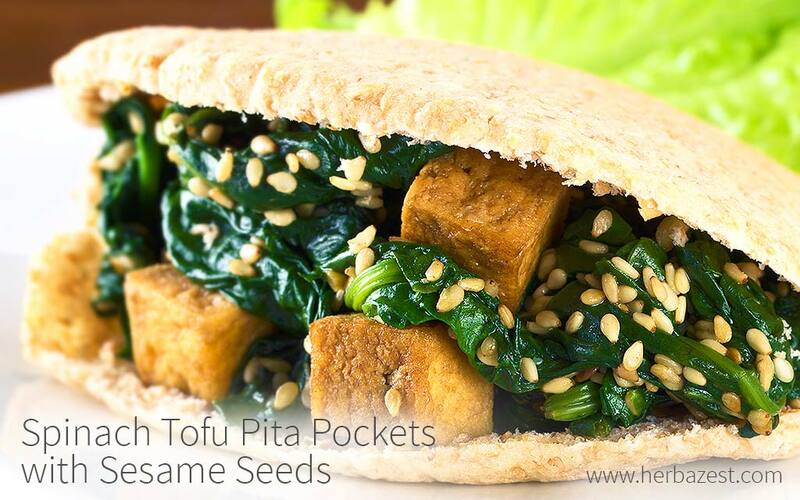 Wholesome and delicious, these spinach tofu pita pockets make for a great meal idea at any time of the day. Spinach brings a whole collection of essential nutrients, like manganese, iron, and vitamins K, B9, and A, all of which contribute to healthy bones, strong immunity, and good eye sight. Tofu, as a soy product, is a great source of protein as well as phytoestrogens, which are estrogen-like compounds that help maintain hormonal balance in the body. Sesame seeds, on the other hand, add a good dose of fiber and omega 3, 6, and 9 fatty acids. Garnish with some more sesame seeds. Serve right away and enjoy!